A few months back, I was eating a Reese’s Peanut Butter Cup and my daughter Sammie asked if she could have a bite because she never had one before. Well now, how can this be that my poor, deprived, 4 year old daughter had never tried a Reese’s cup? In my defense, it wasn’t for lack of trying. 😀 Every offer was met with the insistence “No, I hate peanut butter!”. I can still see her face as she took her first bite. Her eyes lit up and with every bite she exclaimed “This is delicious!”. Well, duh!! Is there really any better combination than chocolate and peanut butter? 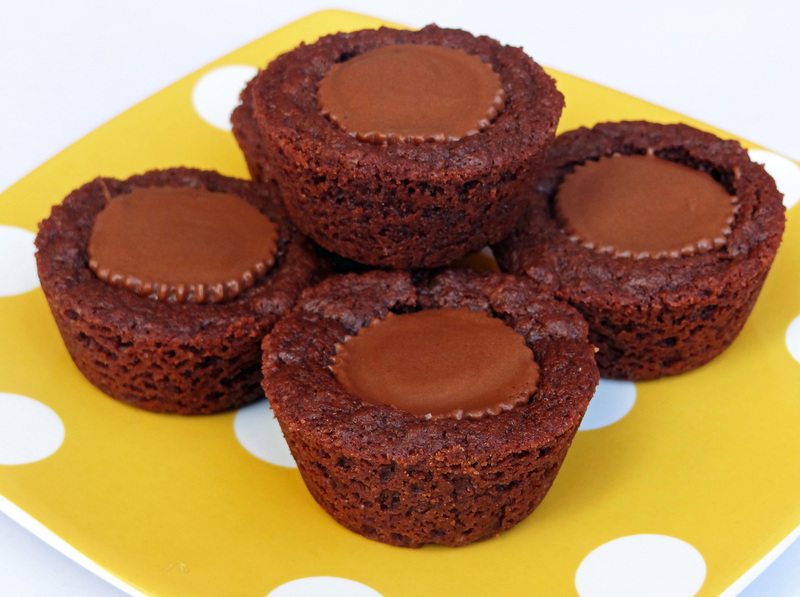 When I saw these brownie cups, I instantly thought of Sammie and how much she would enjoy them. The base is a rich chocolate brownie with a bit of peanut butter to kick it up a notch. (Sorry, I watch way too much Food Network.) 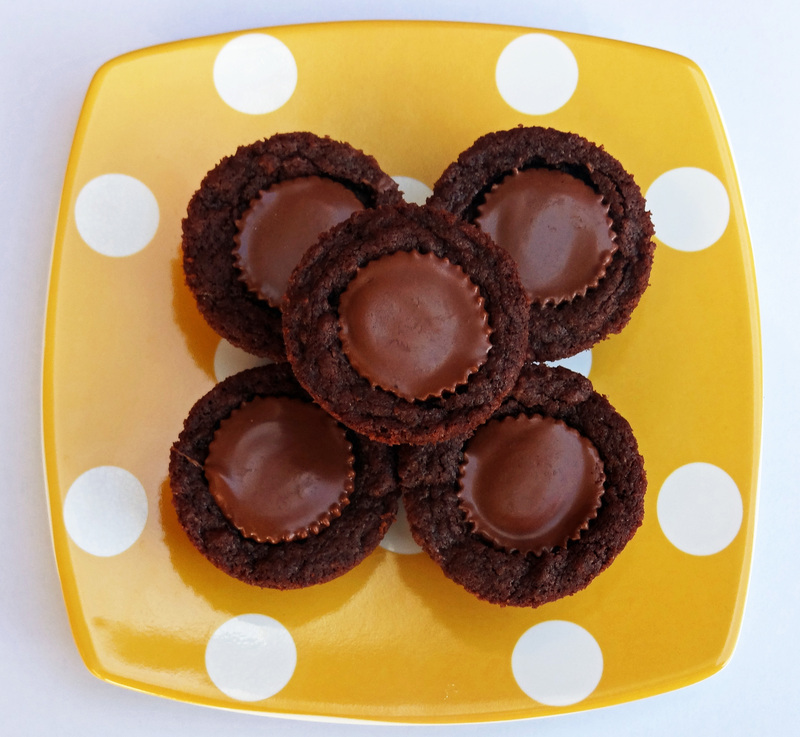 Then, when they are hot out of the oven, you press a peanut butter cup into each one, melting it into the center. If you’re still reading this…you shouldn’t be. You really should be in your kitchen making some of these brownie bites! 😀 Yum. 24 Reese’s miniature peanut butter cups or Rolos, thoroughly chilled and unwrapped. Preheat the oven to 350°F. Grease two 12-cup mini muffin pans or coat with nonstick spray. In a medium, microwave safe bowl, microwave the chocolates and butter on 50% power for 1 minute. Stir well. Continue microwaving on 50% power, stirring at 30 second intervals. Stop when most of the chocolate has melted (but some solids remain) and allow the residual heat melt the rest. Do not overheat! Alternatively, you could use a double boiler. Stir sugar into the chocolate mixture until well blended. Let cool until just warm. In a small bowl, stir together flour, baking soda, and salt. Set aside. Beat the egg and peanut butter (if using) into the chocolate mixture. Add the vanilla and stir vigorously until the mixture is smooth and shiny. Stir in the flour mixture until all is incorporated. Spoon the batter evenly into the mini muffin cups. Bake in the middle of the oven for 10 to 14 minutes (start to check at 8 minutes), or until almost firm when pressed in the centers. Do not over bake. Immediately press one peanut butter cup or Rolo, smaller end down, into the center of each brownie until flush with the surface. Transfer the muffin tins to a wire rack and let stand until the brownie cups are completely cool. Gently loosen the brownie cups with a butter knife or spoon, and remove them from the pan. Store in an airtight container for up to 4 days or freeze up to 1 month. Also, check out Sweet as Sugar Cookies, for her Sweets for Saturday Roundup. Three of my recipes are featured, along with more than 100 other delicious looking recipes!